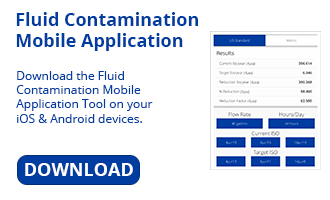 Hydraulic and lube oil fluid contamination causes 75% of all hydraulic component and bearing failures. Increase plant reliability with the efficient Vac-U-Dry vacuum dehydration unit. The VUD series vacuum dehydrator optimizes the balance between heat, vacuum and process design to rapidly remove free, emulsified and dissolved water and gas. Vac-U-Dry dehydrators are also equipped with high efficiency filtration to remove particulate contamination. Keeping fluids clean and dry extends component and bearing life; increasing productivity, minimizing downtime and preventing premature fluid replacement. Achieve and maintain water levels down to 10 ppm for any sized reservoir. Regain control of high ingression conditions in hours instead of weeks or months. Applications include steel mill lube systems (Morgoil), turbine lube reservoirs, oil flushing and reclamation, bio-diesel polishing, paper machine lube oil, gearboxes, compressors and any other hydraulic or lube applications susceptible to water contamination in oil. Other contamination control technologies can be integrated into VUD such as turbine oil varnish removal, phosphate ester acid scavenging and gross free water removal by coalesce for the ultimate oil purifier or turbine oil conditioner. Vac-U-Dry is available with a wide assortment of filter element media options to fit your specific application. Whether you're running low viscosity turbine lube oil requiring super cleanliness or conditioning high viscosity steel mill lubrication systems Hy-Pro will help you make the right selection. For small reservoirs ask us about the portable V1. For more specifications and product information on the Hy-Pro Vac-U-Dry vacuum dehydrators see our product brochure.